Benoit Cheese Haus is a cheese lovers' dream come true! Benoit Cheese Haus is a cheese lovers' dream come true! We are an old fashioned specialty retail cheese shop that carries Wisconsin's finest cheese. And the best part is, you can sample them! We are a destination for friends, co-workers, your significant other or a family day out! You can get a taste of all over Wisconsiin under 1 roof. So if you have a favorite cheese, stop in! We more than likely have it or we will try to get it for you! Benoit Cheese Haus is a country destination! This store has been open with its current mission statement since early 1973! A place where customers could come in for great service and great cheese. Today, the store has expanded to include over 150 varieties of cheeses, fresh-cut to order and prepackaged. We carry everything from FRESH CURDS to 16 year-old Cheddar! We also have a wonderful variety of locally made items, such as: honey, syrups, specialty meats, soaps, candles, knick-knacks, wine and organic oils. We offer made-to-order cheese trays and gift boxes. Call or order online. WE SHIP IN US ONLY. Come sample some great cheese!! "NO one is doing what Benoit cheese is by bringing the best of so many different manufacturers under one roof……They bring the best of the best and then offer discount pricing as well…"
In a small Wisconsin town lives a cheese lover’s dream. The Benoit Cheese Haus near Ashland has been serving up the state specialty since 1973. In this week’s TODAY On The Job, KBJR 6 Today anchors Emma Rechenberg and Ryan Haff stop by the shop to learn more about the different varieties of cheese from owner Jill Jones. 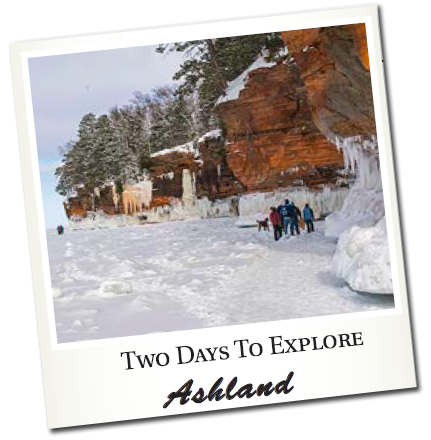 Ashland’s wild beauty beckons outdoor enthusiasts to make the trek north to this spot on a large sheltered bay of Lake Superior known as Chequamegon. Local businesses relish that visitor enthusiasm, providing a warm welcome to snowmobilers, anglers, and cross-country skiers. For anyone looking for a soul-stirring destination, this is it. For those famished from the trip, grab lunch at Burger Barn. We’re talking Wisconsin cheese curds, a bacon burger topped with homemade BBQ sauce, and a Cowpie dessert of cookies and ice cream. Stretch your legs on the city’s self-guided downtown mural walk, a virtual walk through Ashland’s history with 20 murals in all, the newest being the Women of Ashland mural. Stock up on cold-weather clothing and gear at Moore’s on Main, third generation and locally owned. There’s also Solstice Outdoors, a top spot for ski and snowshoe rentals and activewear. For those who plan to cozy up next to a fire with a good book, pop into Spinster Books, where the owner sells more than just books. Lots of options for where to rest your head, starting with The Inn at Timber Cove, with private cottages for rent and breakfast delivered right to your door. Mission Spring Resort is another option, this one ideal for families. Blue Wave Inn is a five-room boutique hotel right on the shore of Lake Superior. There’s ample parking for snowmobile trailers at River Rock Inn, a mom-and-pop motel where you can purchase Lake Superior fish from their shop. Friday evening, be sure to take in the breathtakingly beautiful winter sunset over the bay. Watch it anywhere in town, as there’s not a bad seat in the house. Toast to the weekend with a brew from South Shore Brewery. Try one of their flagship beers, like the Nut Brown Ale or Northern Lights. Then head next door to Deep Water Grille for the Lake Superior whitefish dinner. Saturday morning if you’re in a hurry to hit the snowmobile trails, pick up a pastry at Ashland Baking Company. If you can spare a bit more time, head across the street to Black Cat Coffeehouse, 20 years in business, where the food is made-from-scratch and the menu emphasizes organic, fair trade and vegetarian. Scurry to the snowmobile trails, with 280 miles of groomed trails in Ashland County. There’s bound to be a good base, given the average annual snowfall here is 73 inches. For those who brought their fat tire bikes for pedaling in the snow, there’s the Tri-County Corridor Trail that takes you through Ashland, Bayfield, and Douglas counties. When conditions are right and the ice road is open, you can even bike to Madeline Island. Have a hankering for pizza? You’re in luck, with a trio of top choices - Hugo’s, Frankie’s and Pizza Pub – all open for lunch. If authentic Mexican is what you crave, try El Dorado for the salsa alone. And for those who believe no lunch is complete without something sweet, you’ll love Gabriele’s German Cookies & Chocolates, where the cookie recipes have been in the family for 100 years and the chocolate truffles are all handmade. In the afternoon, turn your attention to ice fishing for trophy trout on Chequamegon Bay. Check on ice conditions and hot fishing spots at local bait shops including Angler’s All or River Rock Inn. Get your heart racing with some cross-country skiing. Copper Falls State Park has 14 miles of trails for classic and 6.5 miles for skate. The 8.6 km loop of the Penokee Mountain Ski Trail in the Chequamegon-Nicolet National Forest has climbs and downhills that demand intermediate skiing ability. Take a side trip to Benoit Cheese Haus, where you can taste before you purchase. There are more than 150 varieties of cheeses here, from fresh curds to 16-year cheddar. Your dinner destination is 2nd Street Bistro. This restaurant has made a name for itself by using fresh seasonal ingredients and supporting local farms. Butternut squash ravioli with wild mushrooms sounds like a good choice here. Then get a nightcap at Scott & Ar’s Bar, where the locals go, or take in a game at The Neighborly Bar. If you still have energy left, make it a late night with blackjack at Bad River Lodge Casino. As for where the locals congregate for breakfast, that would be Ashland Family Restaurant, where the homestyle cinnamon French toast tops the menu. Then make a stop at Sixth Street Market, where they have 38 flavors of homemade fresh bratwurst to choose from. Hope you packed a cooler. If ice conditions permit and time allows, stick around to see hot rods race an oval track on frozen Lake Superior. It happens every Sunday during the winter months. Tip: If the ride home takes you near Clam Lake, slow down for wildlife viewing as this is the Elk Capital of Wisconsin. January 12, Northwoods Harness Club Sleigh & Cutter Rally: See antique sleighs and drivers in period dress on parade at the Northern Great Lakes Visitor Center. For These Local Treasures … Stop the Car! Driving in the Ashland/Washburn area, plan two stops for a true taste of Wisconsin with regional cheese at Benoit Cheese Haus and couldn’t-be-fresher ice cream and milk at Tetzner’s Dairy and its self-serve store. One of the pleasures of stopping at Benoit Cheese Haus, 12 miles west of Ashland, is getting to sample cheeses you’ve never had – and may have never heard of – before. Another pleasure: the big smiles that greet you when you walk in the door. On my visit in August, I came away with two new favorites that I suspect are as new to you as they were to me. Marieke Gouda brand’s foenegreek gouda comes from Penterman Farm in Thorp, Wisconsin, where cheese maker Marieke Penterman, originally from the Netherlands, has won multiple prestigious awards. Foenegreek is a seed, and the cheese has a nutty flavor with hints of maple. This outstanding cheese, best savored with a good wine, sells for $14.50 a pound. Another of my choices is the Sartori brand Citrus Ginger BellaVitano ($13.95 a pound). To Jill, it’s a cross between parmesan and asiago, “with a touch of fine cheddar and a creamy, almost buttery finish with the wonderful ginger and citrus.” I second that. Even those who crave spicy cheese can find happiness here, with a range in “heat” from the mild and popular buffalo to chipotle havarti, jalapeno cheddar, pepper jack, habanero jack or, the hottest, ghost pepper. She grew up “cheesy.” Her grandfather was a cheese maker when Jill was growing up in Appleton, Wisconsin. Benoit Cheese is stacked with shelf after shelf of packaged cheeses in refrigerated cases. It also sells a few other groceries and locally made products such as honey, jams, soaps, wine and souvenirs. All of that helps serve the local folk as well as the visitors. The shop’s styles and prices range from $4.35 a pound for a mild Wisconsin Colby to almost $80 a pound for a 19-year-old cheddar. The age, quality of the cheese and the cheese maker can affect the price, Jill says. The store offers made-to-order gift boxes and can ship throughout the United States. The guest book shows cheese fans have visited from as far as Colorado, South Carolina and Europe. There was also some fun to have in Superior. WITC hosted the annual sip for scholarships fundraiser with proceeds going right back to the students. Of course there was a lot of wine to be had. But this year featured a new vendor. “This year is our first year the Benoit cheese is here so were real excited for that, they’re doing cheese sampling. We always have a lot of wine on hand and then we have 4 distributers doing some brew as well,” Says Organizer, Jasmine Burt. Last year the event raised over 4,500 dollars and they were hoping this year exceeds that amount. Jill Jones is a true Wisconsinite. As the newest owner of Benoit Cheese Haus in Benoit, Wisconsin, she knows her home state loves its cheese. “I couldn’t imagine a world without cheese,” she says with a wry smile. From Havarti, to Colby Jack, Pepper Jack, Swiss, Gouda, and Cheddar, Benoit Cheese Haus in Bayfield County boasts that their store offers more than 150 types of cheese. Jones took over as owner just last year, but she’s been working here for around eight years now. “A man named David Johnson and I revamped it, called it Benoit Cheese, and started doing a lot of advertising out here in the country,” Jones said. And Wisconsin country is cheese country, something Jill is well aware of. Jill researches the cheese herself, and brings in products from all over the state of Wisconsin. And if you come into the shop, come hungry. Benoit Cheese Haus lets you sample their products before you buy them. And if you’re a cheese lover, they pretty much have everything. And the dedication to a huge selection is exactly why at Benoit you’ll find different takes on old favorites, like buffalo wing jack or jalapeno, habanero, ghost pepper cheeses for people who like it HOT! “Whatever heat they can tolerate, they want that hottest one,” Jones said. So maybe you like your cheese to be plain and traditional? Or maybe you want to try something really unique? Either way, Benoit Cheese Haus has you covered. They are open Monday through Saturday from 9:00am to 5:00pm. They are located in downtown Benoit, Wisconsin, right on highway F.